Francine Stock talks to the actor Jonah Hill about The Wolf of Wall Street, plus the film's editor Thelma Schoonmaker. Also The Night of the Hunter and found music with Neil Brand. 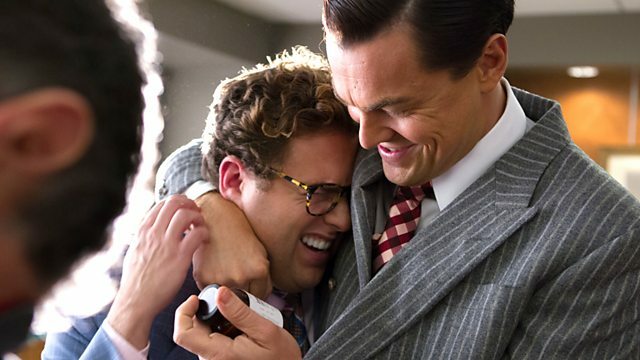 As Martin Scorsese's latest film, The Wolf of Wall Street, picks up five Oscar nominations including Best Picture and Best Director, Francine Stock talks to actor Jonah Hill, nominated for Best Supporting Actor. He describes how improvisation played an important part in the film which is based on the memoir of trader and convicted fraudster Jordan Belfort. We also hear from editor and long-time Scorsese collaborator Thelma Schoonmaker about the alchemy of the cutting room. The composer Neil Brand explores the use of found, or pre-existing, music in film scores from Saving Mr Banks to Inside Llewyn Davis, Raising Arizona and Black Swan. He explores how the often well-known music can be re-invented and manipulated to work on audiences in sometimes surprising ways. Plus The Night of the Hunter, first released in 1955, directed by British actor Charles Laughton and starring Robert Mitchum, is back on limited re-release. Nick James from Sight and Sound and broadcaster Michael Carlson discuss why it has had such an influence on film makers and inspired a genre of brooding southern Gothic. Chiwetel Ejiofor; Frank Cottrell Boyce; Ken Loach; What makes a film British? The best of the day, updated each weekday evening. Programmes relating to the 2014 Oscar nominees, plus the Golden Globe & BAFTA winners.